As usual, my love for this country is on overdrive. Despite the dark parts of our history (there are many, no doubt), I do hold a lot of hope and pride in my heart for good ol’ Canada. It’s nuanced and critical, but it’s there. This is my first Canada Day since I did my cross-country train tour last August. I suppose that should make me feel like I have some level of insight on this country. Not so much. The more I have learned and seen of this country the less I want to make general claims about it. Even writing this seems a bit strange. BUT BUT BUT, there are five things that I observed that felt pretty solid. So here goes. Just for you, just for Canada Day. Let’s listicle this bad boy. 1. 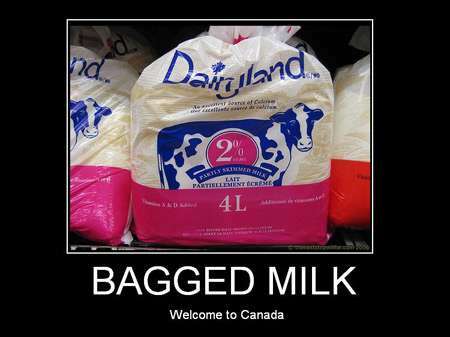 Canadian humour? I think it’s a thing. I met a lot of funny people on my trip. Good storytellers, great attitudes. At the Just For Laughs festival, I tried (with little success) to crack the code of Canadian comedy. While that experiment fell flat, the people I met as I traveled across this country gave me more of a clue. Which it is. Living in Canada is kind of ridiculous. The weather, the empty space, the strange array of cultural indicators (a leaf and poutine and hockey and whatnow?). Canada also has the unique position of having a lot of rural spaces, small towns, and harsh winters…while also having a literacy rate of 99% and high scores on international education rankings. I’m sure the doesn’t hurt the development of a unique kind of outdoorsy wit. Everywhere I went in Canada, the communities I visited seemed to offer community in relatively the similar ways–survival, sports, music, food, drink, repeat. Obviously events varied based on size and geography, but generally it was pretty status quo–downtown parades and fireworks on special occasions, community theater in the warmer months, concerts in the park, sports bars with hockey specials. In Halifax, the experience made me seriously question why I didn’t just do more of these things at home. That said, I found that community often wasn’t a super important value for folks in Canadian cities. I’m guessing that’s because “survival,” which is historically at the heart of most Canadian communities, has become less and less an issue (thanks, indoor heating and modern medicine). We all are relatively free and mobile and proudly different, so sometimes it feels like we don’t seek each other out as much. But we do still need each other. And the lucky thing is that community is available, and it is worth pursuing. I found it literally everywhere I went, and it was awesome. 3. Oh, and French is also everywhere. My whole life, I was fed this ugly lie that there are only French Canadians in Quebec. No where else. Turns out, that is so very wrong. Seriously, if I ever have kids, I’m raising those buggers to be bilingual. I underestimated the Frenchness of this country so much. It’s everywhere. When I went to the French quarter of Winnipeg, no one was speaking a lick of English. Not to mention New Brunswick, or Northern Ontario. I even met a tour group of French first language kids from British Columbia recently. Yes, Quebec has a lot of French people. But it also has more people, period. I loved Quebec culture and deeply enjoyed my time there, but I was wrong to assume that different versions of French Canadian language and culture didn’t stretch from sea to sea. Oh, you thought Americans were proud? Yes, the United States is known for having overzealous residents who are patriotic to a tacky degree. But when I worked and lived in the States, it turned out that I was the one who patted myself on the back for my citizenship on a daily basis. Gay rights? Medicare? Cool looking federal police officers on horseback? Canadians think they are the coolest. It can be annoying, I’m sure. I was basically like that pretentious friend everyone has who proudly collects records and forces obscure music on everyone…except instead of indie tunes, I was dealing out ketchup chips and maple syrup. 5. We don’t really go to church. Empty pews are certainly a major theme throughout the country. I don’t totally know how I feel about that–the United Church of Canada is a big part of my life, and I think the church can be a wonderful and remarkable space for people (see point #2). But I’m not necessarily disappointed in our emerging “churchlessness.” I’m mostly just curious about it. I’ve heard a whole host of reasons for people moving away from the church, most of which are not only confined to Canada: Corruption, postmodernism, the perceived conflict between science and religion (or between social justice LGBT/women’s rights and religion), individual spirituality over community practice. I get all those things, I do. But Canada is an interesting study simply because recent generations have been so privileged, so lucky, so educated and connected, so blessed….and so secular. I often wonder if there is a connection. Either way, it will be interesting how churches and people transform in this environment. Basically, I learned that Canada is the True North strong and free…and funny…and diverse…and proud…and changing all the time. All the time. Like, right now. So, I guess we should probably go out and look at it pretty seriously and take good freakin’ care of it. Because whatever this country becomes…we’re a part of it. I learned awhile ago that the “journey” was a significant part of any voyage. Maybe even the most significant part. The clichés are with me. Usually, my definition of the “journey” has to do with road trips, running for trains, and airplane (mis)adventures. When I was 16, I decided to sleep on a bench during a twelve hour layover in France–and classy is as classy does, that is now the sum total of my Paris experience. Total strangers on train rides have offered insights on communism, abusive relationships, grieving, and the Beach Boys (you know, typical polite conversation). Confusing maps, broken down buses, tight connections and “Oh! Finally! Coffee!” are all memories. They’re good memories. They’re funny. The actual “traveling” is always at least half the fun. Currently, though, I’m becoming acquainted with another side of “the journey.” This part is happening at home, in Ottawa. No wheels underneath me. No open road or visible sky. Instead, this part involves sitting on my couch with a mug of hot tea. (I should point out that it’s not really a couch. It’s a futon mattress propped up against a wall. Again, classy is as classy does.). Music is playing, a YouTube lyrics video of a catchy song on repeat for the 10th time. And browser tabs. So many browser tabs. Train schedules. Tourist destinations. Hostels. Bus fares. Airline discounts. Local blogs and forums. Festival lineups. Oh-my-goodness, am I really doing this? Am I really taking a month off to travel across Canada? More importantly, how do I even start planning for this? 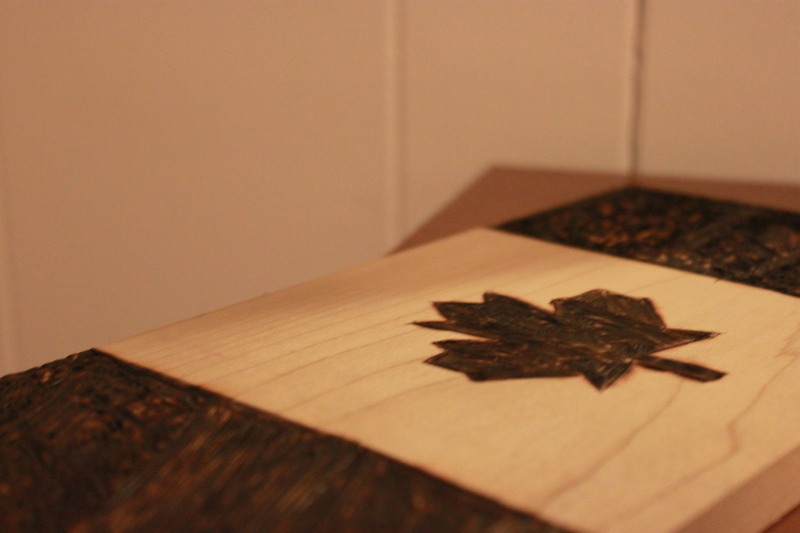 Props to my brother Mike for wood-burning my awesome Canada flag. I have a plane ticket to Halifax. I have a 21-day train pass, scheduled to start as soon as I’m done with the Maritimes. My family and friends across the country have been warned. I’m scheduling, scheduling, scheduling. It’s a lot more work than I thought it would be. It’s a whole lot of fun. And it’s definitely part of the journey. While living in your country, I have had the pleasure of sharing a laugh with…well, some of you. Not all of you. 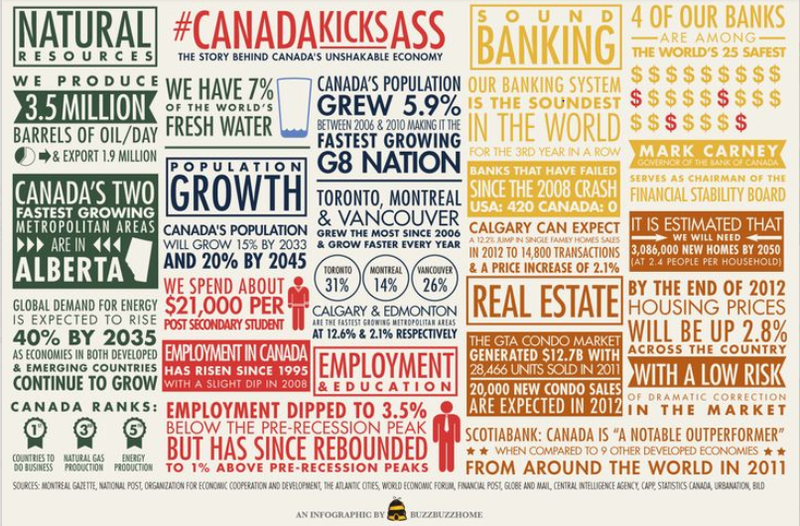 Seems that you don’t know enough about Canada to make a joke about me without worrying that you’re totally offbase. Truthfully, I don’t know enough about your country, either. And so we just sit here politely, giggling about the weather. But the weather just isn’t that funny. I’m sorry. Ottawa is cold. Washington DC is not as cold. We have both run out of amusing ways to express this. The romance is gone from our adorable “Oh goodness, how does one convert Celsius to Fahrenheit?” conversations. It’s not your fault, America. I’ll explain. I won’t write in detail about any other city or province, but I will take a moment to write about Toronto. I will write about Toronto because I grew up just an hour outside of it. Because I love the Blue Jays (baseball), I hate the Leafs (hockey), and have anecdotal reasoning to back both of those up. I will also write about Toronto because DUDE, OTTAWA IS THE CAPITAL OF CANADA NOT TORONTO(!!!!). I’m sorry. I didn’t mean to yell at you. You didn’t know. Let us treat this as a learning moment. Toronto is the largest city in Canada. It’s serious metropolis–17 percent of the nation’s total population lives in or around T.O. (ie the “Greater Toronto Area” or “GTA”). Toronto is actually an alright city, save for the fact that it’s, well, city-ish (shocker). If you don’t like cities, you won’t like Toronto. If you do like cities, it will probably work for you. Credit where credit is due, Old Toronto and Toronto Island are beautiful. The Hockey Hall of Fame and the Royal Ontario Museum are neat. Toronto Rock Lacrosse games are the best. They call this the “Edge Walk.” Toronto goes hard. Here’s where the “center of the universe” thing comes in. For what it’s worth, most Torontonians I know have a few bones to pick with guys like this, too. What makes a true Torontonian is hard to identify (so far, all can pinpoint is that they seem to yell “Say word!” when they are enthused). Immigrants make up almost half of the city’s population, so it’s a VERY diverse place. We must continue making fun of them. On Shopping and Eating in Canada. There are a few things on Canadian grocery store shelves that ‘Murica lacks. These are real foods, by the way. Would I lie to you about something as serious as ketchup chips? Canada gets awfully fancy with it’s potato chip flavours. In equally fancy fashion, we also spell the word “flavours” with a “u”. 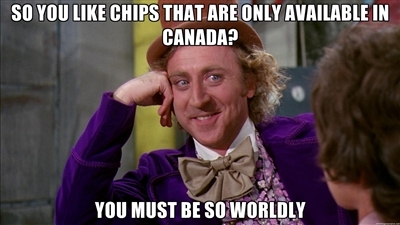 To be fair, those Fries n’ Gravy chips on the right are only available in Atlantic Canada. The East Coast knows what’s up. Yes, things are a little different in the Canadian snack aisle. Growing up in Canada, my Halloween stash also looked quite a bit different than its American counterpart. Here are some examples, presented to you via slightly disturbing fan videos. Thanks, YouTube. 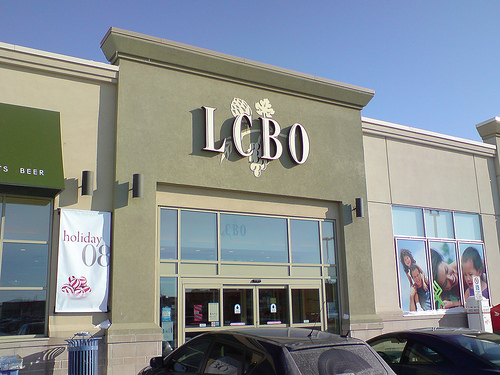 Canada also has a few restaurant chains you may not be familiar with. The Cara restaurant family and Tim Hortons can easily take responsibility for at least 80% of the teenage employment in my hometown–including mine. Growing up, I spent time working at both a Swiss Chalet (a Cara restaurant that basically only serves chicken) and a Timmy’s (the staple coffee-and-donut place which fuels the Canadian people). 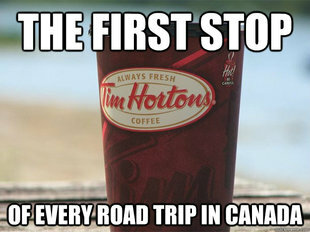 Some states actually have these now, too, but it’s still a Canadian thang. Double Double: Two creams, two sugars. Triple triple: Three creams, three sugars. 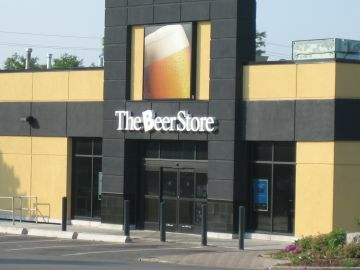 Ultimately, what you should know that 1) If you’re ever looking for a pint in Canadaland, I’d say Alexander Keith’s is a solid choice; and 2) A “two-four” isn’t a hardware term–it’s a 24 pack. If you’re looking for real “Canadian cuisine,” the only options I can think of off the top of my head are poutine (fries topped with cheese curds and gravy), peameal bacon (aka Canadian bacon), and anything drenched in maple syrup. That said, it’s a really big country. Regional foods are definitely worth checking out. I have no further explanation for that, except that it’s legit. As an Ontario kid, I grew up with it, so it seems totally normal to me. 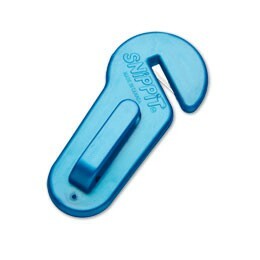 If you’re trying to figure out how the heck that works, a quick google image search will clear up the mystery for you. Canada is a Constitutional Monarchy. That means the Queen is our “Head of State,” but that we have an elected, multi-party Parliament that really runs the show. We also have an appointed Senate designed to double check everything done by the elected representatives (ie “the house of sober second thought”). “You mean, kinda like Britain?” Sure. “You mean, kinda like ‘Murica?” I guess. “You mean, kinda like Australia?” Maybe? …or doesn’t, if you’re feeling cynical. Canada is a multi-party system. Right now we have Federal representatives from five different political parties: The Conservative Party, the New Democratic Party, the Liberal Party, the Bloc Québécois, and the Green Party. Translation: We have one right-wing party, three left-wing parties…and one party that wants Quebec to separate from Canada. After living with some very Republican roommates here in DC, it’s worth noting that by American standards, our right-wing party isn’t all that “Conservative”–though it’s arguably moving in that direction. Canada runs a bit differently than the US; We have socialized health care, no capital punishment, and legal gay marriage. 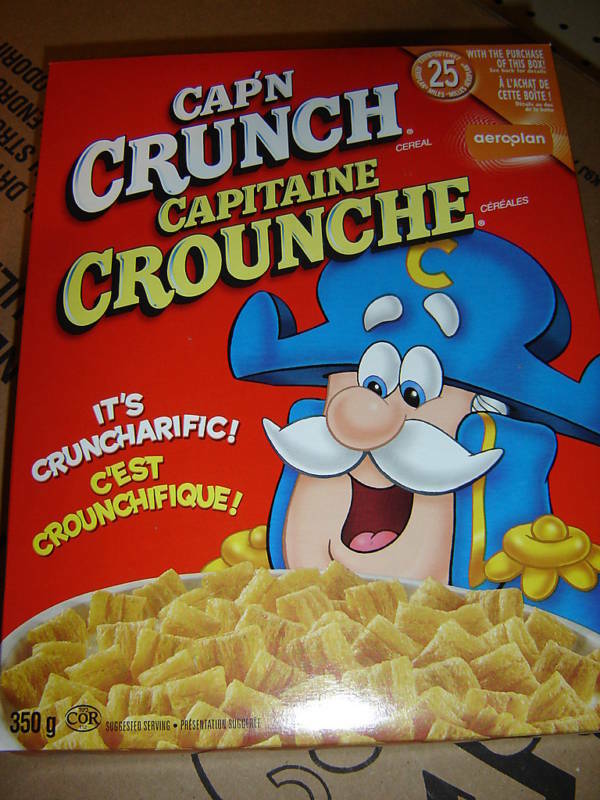 We also spend a lot of time translating stuff into French. Oh, and that appointed Senate? Yeah. It’s pretty controversial. I hope that clears up a few things about Canada for you. I tried to respond to the FAQ as much as I could, but let me know if there’s anything I missed/didn’t explain very clearly.